Marsai Martin attends the 2018 Pre-Emmy Party hosted by Entertainment Weekly and L'Oreal Paris at Sunset Tower on September 15, 2018 in Los Angeles, California. Marsai Martin tied her look together with a silver glitter clutch by Vince Camuto. 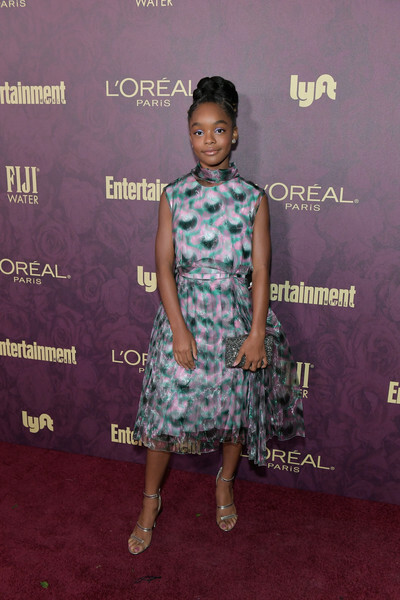 Marsai Martin cut a stylish figure in a graphic print dress by Prada at the Entertainment Weekly pre-Emmy party. Marsai Martin paired her dress with strappy silver heels by Tamara Mellon.